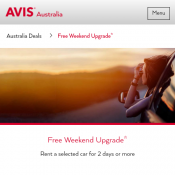 Rent an Economy (Group A) through to a Full Size (Group E) car with Avis in Australia for 2 or more consecutive days including a Saturday night and receive a free single upgrade up to a maximum Full Size Sports (Group P) car. Include coupon number UPPA021 in your reservation. Valid on rentals commenced before 30 June 2018. Offer available at all Avis Australia locations for vehicles collected before 30 June 2018. Advance reservation including coupon number UPPA021 required. Cars and upgrades are subject to availability at time of rental. Minimum rental period of 2 consecutive days applies including a Saturday night. Valid for a one car group upgrade from a Group A, Group A to Group B, Group B to Group C, Group C to Group D, Group D to Group E, Group E to Group P - Maximum upgrade to a Group P.
Drivers under the age of 25 can only rent car groups up to a Standard 4 door automatic.